Accounts Login Related – account retrieval, blocked account, forgotten email, subpass blocked, etc. Cash Items – problems with Cabal Cash, Top Up did not reflect, unable to buy at Item Shop, etc. Scroll up and you will see the confirmation that the ticket has been sent. NOTE: Customer support will contact you via the email address you gave, so regularly check your email for their replies. Mga madalas itanong sa pagpa-file ng ticket sa iBox: Dapat ba akong mag-login or mag-register pa para makapag-file ng ticket? Hindi na. I-fill up lang ang iBox form para makapag-send ng ticket. Pwede ba akong mag-explain sa ticket gamit ang Filipino language? Oo naman. Para mas ma-explain mo ng maayos ang iyong concern. Nung nag-file ako ng ticket, white at blank page lang ang lumabas after ko i-click ang SUBMIT button. I-scroll up mo lang ang web page, nasa taas nakalagay ang confirmation message kung nagsend ng maayos ang ticket mo. Gaano katagal bago sila mag-reply sa ticket? Ang standard na time range ay 1 to 3 days after mag-submit ng ticket. Paano ko malalaman kung may reply na sila? Magre-reply sila sa email address na binigay mo sa kanila nang mag-file ka ng ticket. Kaya regular mong i-open ang email mo para i-check kung may reply na. Saan ko makikita ang ticket ID o sisID? Kapag nag-reply na sa iyo ang customer support agent, nasa subject line ng email reply nila ang ticket ID. Example: RE:[@sisID:12345] Game Related Enquiry Paano mag-follow up ng ticket? Sumali sa official community group ng cabal. Maaari kang mag ibigay ng iyong contact email na ginamit sa pag-file ng ticket sa mga Game Moderators via private message. Paano kung wala akong valid IDs? Kung below 18 years old ka pa lang, maaari mong gamitin ang iyong NSO birth certificate or school ID / registration form. Maaari rin gamitin ang NBI clearance or barangay clearance. If you cannot open your account and is showing an ‘ID has been blocked” error message, please follow instructions below. If your account was created and migrated from e-Games, your account has an account pin. If your account was created in Level Up! Play, there is no account pin. Support Team will contact you through the email address you indicated on your ticket. Go to the character selection screen. Click the ‘lock’ icon on the upper right corner of the character list. Sub-Password dialog box will appear. 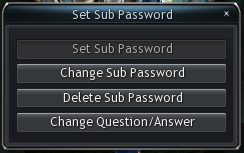 Click ‘Change Sub-Password’ button to change your sub-password. Depending on your antivirus settings, it may repeatedly scan and block the game guard and game files every time you open the game, which will often result to files getting corrupted or files not being patched properly. Adding it to exemption list will exclude the files from being scanned. Close the ESET and restart your PC.